Sometimes life beats the crap out of you. Other times, it gives you exactly what you want. 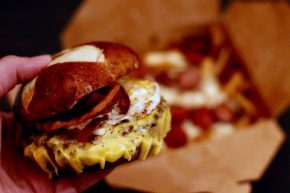 So when what I wanted was some good new food in Pasadena, Spudds suddenly appeared and fulfilled the latter. 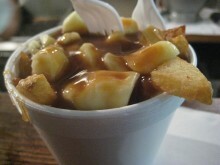 You see, Spudds specializes in poutine and I am a man who loves his fries with gravy and cheese curds. 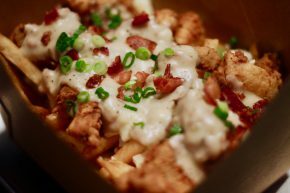 Plus, as far as I know, Spudds is the only original (unlike Smoke’s Poutinerie in Hollywood, which as you probably know from reading up here has a number of outposts in Canada) poutine spot in all of the LA area. After a few drinks, our tour guide (aka the girlfriend’s bro) took us to a little hole in the wall called Pommes Frites. Here, they specialized in cones of Belgian fries served with some crazy sauces like Pomegranate Teriyaki Mayo, Irish Curry and more. These seemed all good and well, but I saw something on the menu that tickled my fancy even more: Poutine. For the uninitiated and un-Canadian, poutine (pronounced pooh-teen) is a gloriously unvegan treat consisting of fries topped with cheese curds and gravy. This combination creates something spectacular, yet rarely found south of the Great White North. It had been a long time since I was in Canada and I was with a couple poutine virgins, so we ordered a large one to split for six bucks.